Great care has been taken to replicate this casting right down to the smallest detail including the pattern joint lines for the loose pattern piece and the type set of original pattern reference numbers. The actual finish of this casting and machining is almost indistinguishable to the originals. The main bore is machine cut and then reamed for absolute accuracy using similar jigs and processes for the chassis castings we manufacture. 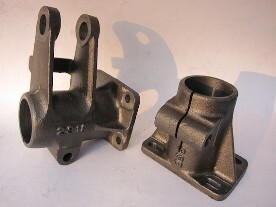 These casting can be used for the L & K type models although some of the original factory batches of footbrake anchor castings incorporated a wavy edge profile to the crosstube bore and also occasionally highlighted a different casting reference number (1606) otherwise they are identical. The nearside casting for all models appears to have been the same for all i.e. Ref 958 as shown above. The footbrake casting can technically be used for the F, D and J type although no pinch bolt assembly was incorporated for these models (as there was no gearbox crosstube mount) and no casting number appeared. In addition, the rake angle of the upright pedal anchor points on these models was vertical and largely symetrical in side profile as opposed to a marginally forward leaning position of the later P/L/J4 ones shown above.